(Nanowerk News) The probe of an atomic force microscope (AFM) scans a surface to reveal details at a resolution 1,000 times greater than that of an optical microscope. That makes AFM the premier tool for analyzing physical features, but it cannot tell scientists anything about chemistry. For that they turn to the mass spectrometer (MS). Now, scientists at the Department of Energy's Oak Ridge National Laboratory have combined these cornerstone capabilities into one instrument that can probe a sample in three dimensions and overlay information about the topography of its surface, the atomic-scale mechanical behavior near the surface, and the chemistry at and under the surface. This multimodal imaging will allow scientists to explore thin films of phase-separated polymers important for energy conversion and storage. Their results are published in ACS Nano ("Co-registered Topographical, Band Excitation Nanomechanical, and Mass Spectral Imaging Using a Combined Atomic Force Microscopy/Mass Spectrometry Platform"). "Combining the two capabilities marries the best of both worlds," said project leader Olga Ovchinnikova, who co-led the study with Gary Van Berkel, head of ORNL's Organic and Biological Mass Spectrometry Group. "For the same location, you get not only precise location and physical characterization, but also precise chemical information." Added Van Berkel, "This is the first time that we've shown that you can use multiple methods through the atomic force microscope. We demonstrated for the first time that you could collect diverse data sets together without changing probes and without changing the sample." The new technique for functional imaging allows probing of regions on the order of billionths of meters, or nanometers, to characterize a sample's surface hills and valleys, its elasticity (or "bounciness") throughout deeper layers, and its chemical composition. Previously, AFM tips could penetrate only 20 nanometers to explore a substance's ability to expand and contract. Adding a thermal desorption probe to the mix allowed scientists to probe deeper, as the technique cooks matter off the surface and removes it as deep down as 140 nanometers. The MS's precise chemical analysis of compounds gave the new technique unprecedented ability to characterize samples. "We're now able to see subsurface structure that we were blind to before, using standard techniques," Ovchinnikova said. In the past, scientists measured physical and chemical properties on different instruments that displayed data on different resolution scales. The width of a pixel of AFM data might be 10 nanometers, whereas the width of a pixel of MS data might be 10 microns--a thousand times larger. "The resolution of the chemical identification was much poorer," Ovchinnikova emphasized. "You would take images from different techniques and try to line them up and create a melded image. Because the pixel sizes would be so different, alignment would be difficult." The ORNL innovation fixed that problem. "Because we are now using one setup, the pixel sizes are very similar to each other. You can pinpoint one pixel and correlate it to another pixel in the image," Ovchinnikova said. Now scientists can perfectly overlay data, much like digital cameras faultlessly stitch together smaller pictures to create a panoramic image. It took a team to characterize the topographies, nanomechanics and chemistry of phase-separated domains and the interfaces between them. The scientists tested their combined AFM/MS platform by probing a phase-separated polymer thin film. Vera Bocharova, of the Soft Materials Group, made a 500-nanometer-thick film with polymers that separated into islands of poly-2-vinylpyridine in a sea of polystyrene. Vilmos Kertesz developed software to link analysis capabilities, and Van Berkel, Ovchinnikova and Tamin Tai set up the experiment and took and processed data. Mahmut Okatan, Alex Belianinov and Stephen Jesse of the Center for Nanophase Materials Sciences set up equipment to probe atom-scale mechanical properties. Anasys Instruments, a developer of thermal probes, loaned the researchers a modified AFM instrument for the experiment. The company owns probe-tip intellectual property and licensed ORNL technology that uses heated AFM probes to remove matter from the surface and subsequently transport and ionize it for mass spectrometric analysis. Anasys recently received a phase-2 Small Business Innovation Research grant from DOE to couple atomic force microscopy and mass spectrometry in a commercial product. Such a device would bring multimodal imaging out of the rarified realm of national labs and into the larger scientific community. Ovchinnikova envisions companies using the technology to answer fundamental questions about product performance. If a polymer blend--in a rubber tire or plastic bottle--is failing, why is it failing? In a stressed area, how are nanomechanical properties changing? What is the exact chemical composition at points of failure? "This is something that AFM by itself could never see. It could just see differences in mechanics, but it could never really tell you precise chemistry in a location," said Ovchinnikova. 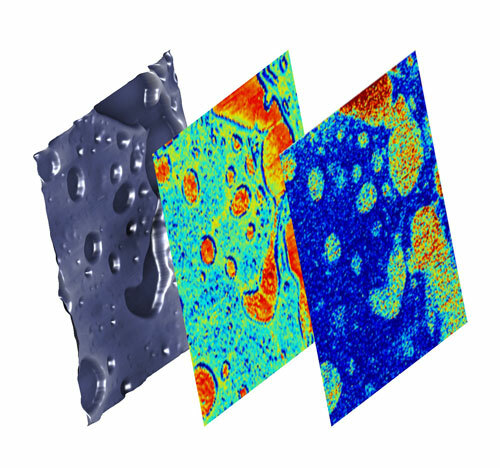 The ORNL researchers are eager to explore scientific challenges that could not be addressed before the advent of high-resolution chemical mapping. For example, a better understanding of the structure and properties of solar-energy materials may speed improvements in their efficiency. Next, to make multimodal imaging even more powerful, the researchers are considering coupling thermal desorption mass spectrometry -- a destructive technique that cooks matter off a surface to enable its chemical analysis -- with optical spectroscopy, a nondestructive technique.